Introducing SR Huddle—a whole new way to communicate and connect in the office. Communicate. Coordinate. Collaborate. All with the click of a mouse. Stop leaving sticky notes. It's time to go digital. A successful healthcare team stays in constant communication about all the changes that happen throughout the day. And sticky notes and running up and down the halls are not effective. It's time to move into the twenty-first century with electronic intra-office communication through SR Huddle. Studies show that poor communication between staff members leads to inefficiencies, mistakes, and lost revenue. SR Huddle, an intra-office chat and communications platform, creates a “virtual” water cooler for team members to gather around all day long. 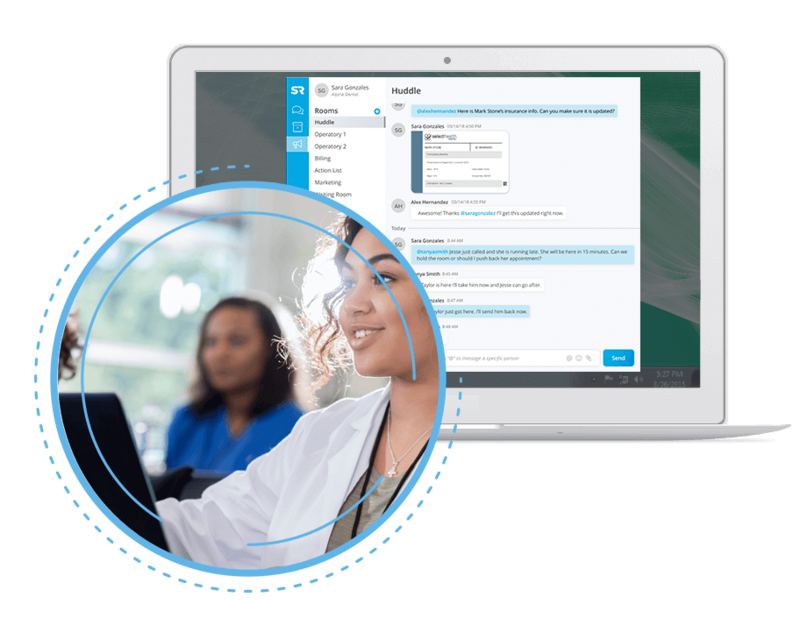 With features like group messaging, custom chat rooms, direct messaging, notifications, photo sharing, and more, you will never be more than a click away from the info you need. The average staff wastes 74 minutes each day trying to track down colleagues or find key info. 96% of executives say that a lack of intra-office collaboration or poor communication leads to mistakes. A practice with effective intra-office communication is 50% more likely to have low staff turnover. Successful communication efforts go beyond reaching out to patients. Your staff needs to pass important info to one another as well. Enter SR Huddle. With SR Huddle, you no longer have to hunt down team members to get your questions answered. If you’ve got a patient cancellation or last minute appointment, you can let everyone know with the simple click of a button. If another team members tags you in a conversation, you will be immediately notified. Sometimes the best solutions are simple solutions. Tracking down important info or locating coworkers can give even the most patient employee a headache. But not anymore. 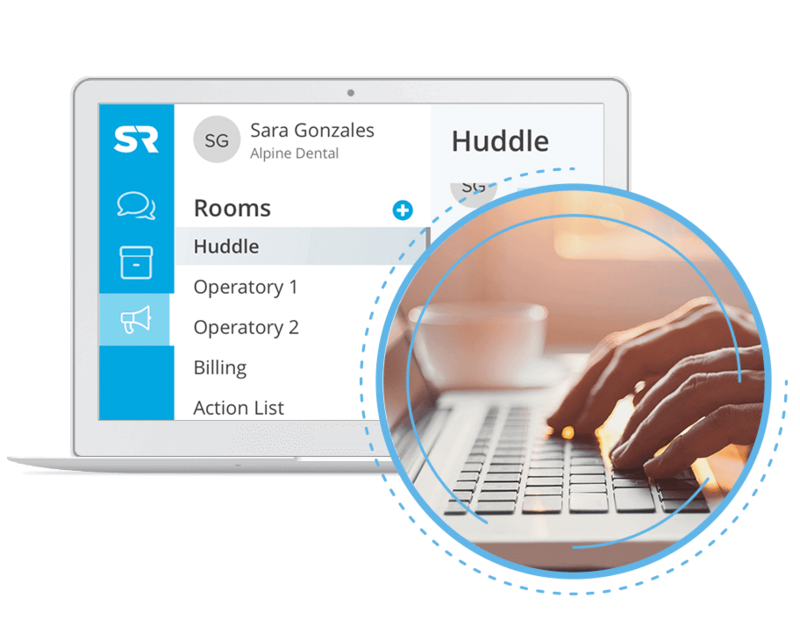 Find out how SR Huddle makes communication in the office 100x easier. Did you know that 46 percent of employees say they rarely or never leave a meeting knowing what they’re supposed to do next? Wow. Help staff coordinate responsibilities beyond team meetings with SR Huddle. 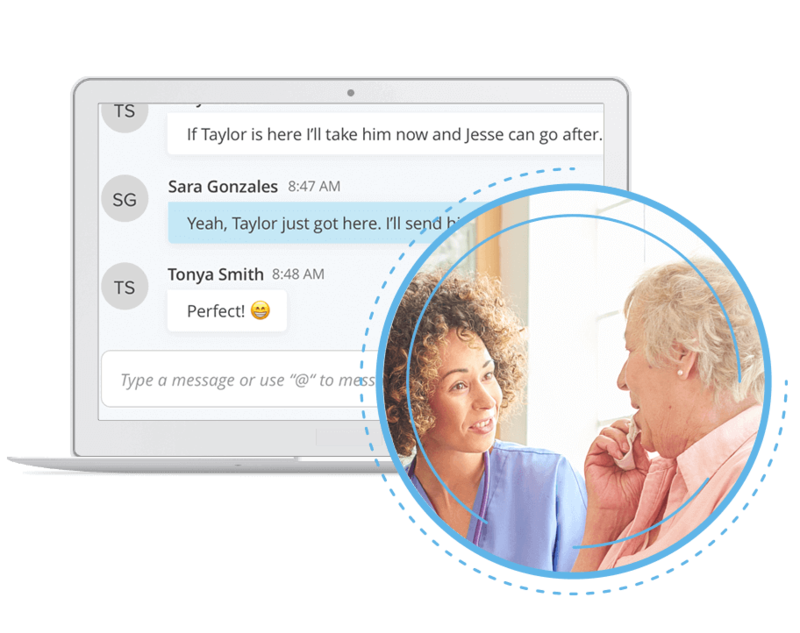 From group messaging to custom chat rooms to direct messaging and more, SR Huddle makes sure you are always in contact with everyone on the staff. Your staff is like a hive of knowledge. If your workers can’t share their expertise with one another easily and efficiently, you are missing out. Two out of three employees say that their colleagues could help them do their job better. SR Huddle lets them do just that. Need to send a direct message to a single staff member? SR Huddle’s got you covered. Want to create a team room for just a few coworkers? You can do that as well.  Need to shoot a picture of an insurance card to your billing person? SR Huddle makes it easy. The possibilities are endless. 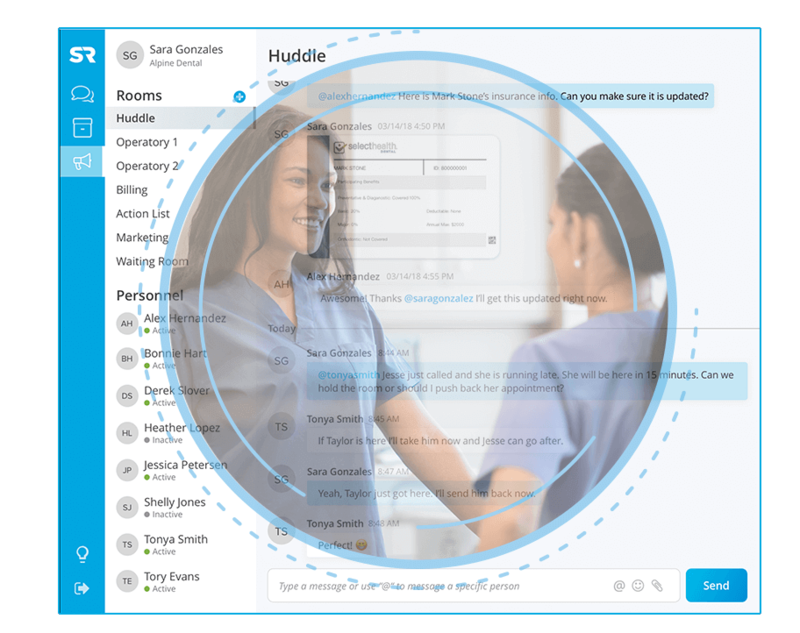 Let us show you how SR Huddle can revolutionize your intra-office communication. Sign up for a demo today!